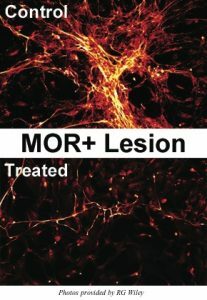 Dermorphin-SAP (MOR-SAP) targets and eliminates cells expressing the mu opioid receptor (MOR). MOR-expressing neurons have long been considered some of the most important cells in the nervous systems because of their participation in pain, pain control, addiction, gastrointestinal motility, and mast cell function, among others. This specific cytotoxin provides new methods for understanding these neurons and how they work. MOR-SAP is not suitable for retrograde transport. Dermorphin-SAP eliminates mu-opioid receptor expressing cells. All other cells are left untouched. Not suitable for retrograde transport.